Update: iSoft's June 8 announcement qualifies as an accounting funny - the scribe's position reverts to Mr Whiston must go. Sanctuary plc is a mess; two previous posts cover this here and here. "The board's decision to remove Mr Taylor followed their conclusion that certain of the prior year adjustments made in the 2005 accounts should have been presented as a correction of fundamental errors and not as changes in accounting policy." An ironic termination for an accountant and one which calls to mind another CEO accountant - Mr Whiston, of iSoft plc. He too sits on an accounting mess which this scribe has written ought to end his term with the company. On the assumption - hitherto rejected - that Mr Whiston is capable of rebuilding investor trust, well, everyone deserves a chance to put right their ship. Provided there are no more accounting funnies to appear. The writer owns iSoft plc equity. Goldman Sachs and Merill Lynch have the same forecast for the Baltic Dry Index (BDI): softer prices in 2006 lead to increased scrap rates followed by a steady upturn into 2007 and 2008. This is likely too sanguine. * Although a year-over-year increase, the rise in China's iron ore usage was not incremental - it came at the expense of other major steel producers. 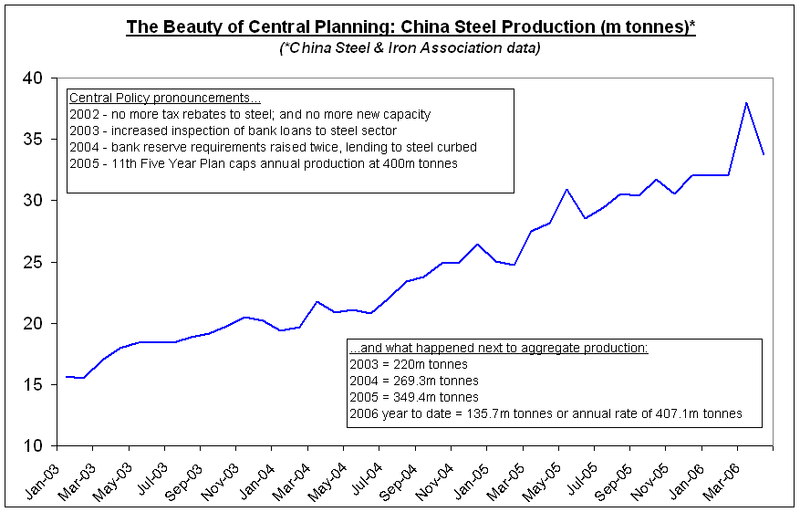 Accepting the argument that China's central planners are not capable of slowing down the steel industry implies either other major producers will have to shrink at Chinese expense as in 2005; or that steel prices and margins are headed for falls. Other things being equal, the first outcome suggests flat dry bulk rates; and the second an initial rise followed by a steel glut and sharply lower freight rates. Until either denouement, shippers and the BDI at best will enjoy a stable environment whilst miners (contrary to current market sentiment) will laugh all the way to the bank. As bullet-proof is the film, so it seems are iron price hikes. A year ago the Priory of Sion - sorry, the Big 3 iron ore producers - secured a 71.5% increase in prices largely by exploiting non-Chinese steel mills' fears of insufficient supply in the face of huge Chinese demand. This year's rise with non-Chinese producers is +19% (same Big 3 strategy - it ain't broke) and it is likely that China's steel mills will have to swallow the same. It does not take a Harvard symbologist to decipher the miners' argument: China's demand compels expansion of supply (read capex) and it's normal that price increases fund this. And, by the way, increased energy costs ramping up miners' operating costs don't help either. With steel prices relatively soft non-Chinese steel mills must be rabid at the idea of being made to fund more Chinese production. Overcapacity risks include China becoming a net exporter, an outcome that would surely come about concurrent with the deflation - orderly or otherwise - of the Chinese construction bubble. Global knock effects considerable. 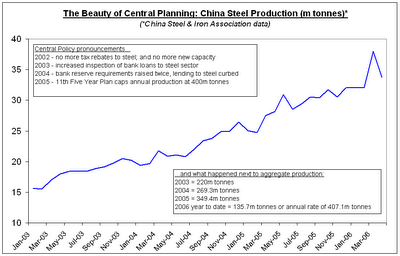 But why doesn't Chinese capacity simply calm down via market triggers like iron ore price increases? Da Vinci Code aficionados will know their villain as Silas, the handgun carrying Opus Dei monk. In this production the equivalent is Chinese Central Planning. Having long incentivised the steel sector the government is finding it a bit difficult to break the overcapacity code before time runs out. 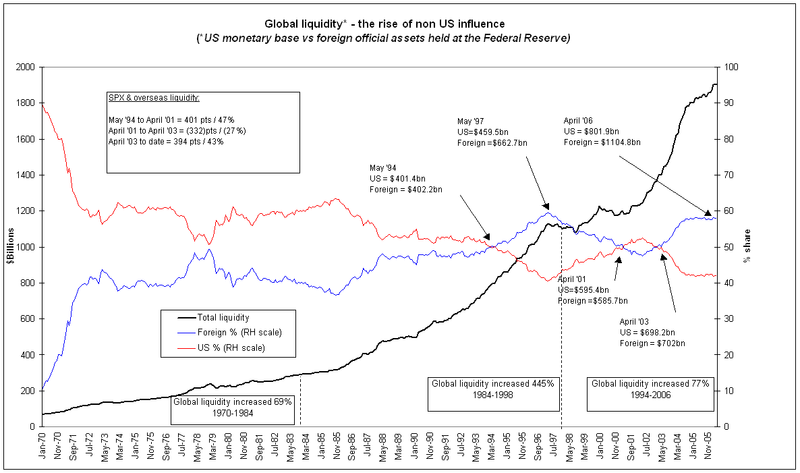 Before global equity markets lifted off circa 1984, it was the US monetary base, with a near two thirds share of total liquidity, that counted. 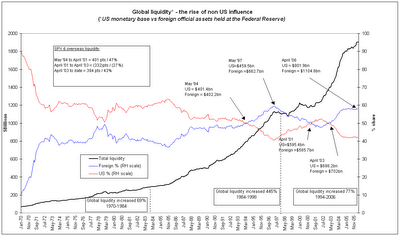 Today the difference is startling: global liquidity has increased almost ten times; and since 1994 foreign official assets have usually dominated - their share today stands at 58%. 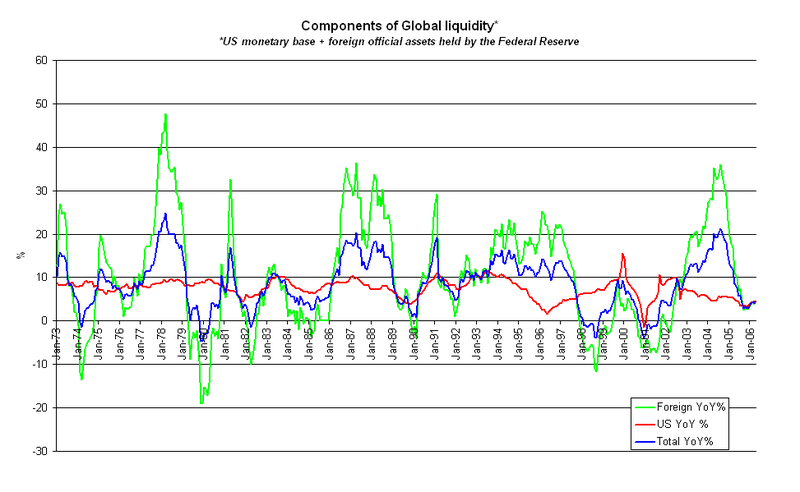 Compared to the US monetary base, foreign official assets punch above their weight in terms of volatility (see Exhibit 2 below). And now, at over half the total, changes to foreign assets overpower those to the less volatile US monetary base component that much more. 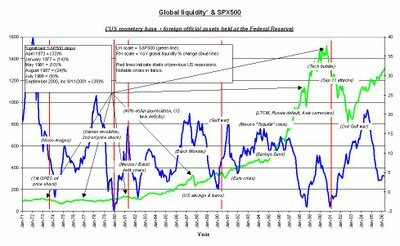 Twice since 1994 foreign official assets have been taken off the liquidity board - in 1998 and 2000 - and shortly afterwards the S&P500 made corrections (as in 10% or more). Today's context remains such that the weight and volatility of foreign official assets continues to demand investor attention: any contraction is a significant indicator of possible equity trouble ahead. 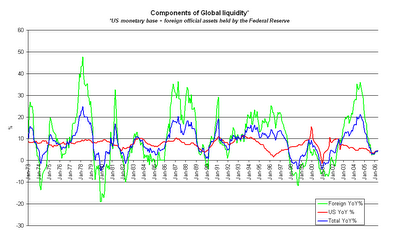 The last available data point for foreign official assets shows a 4.1% year-over-year expansion. 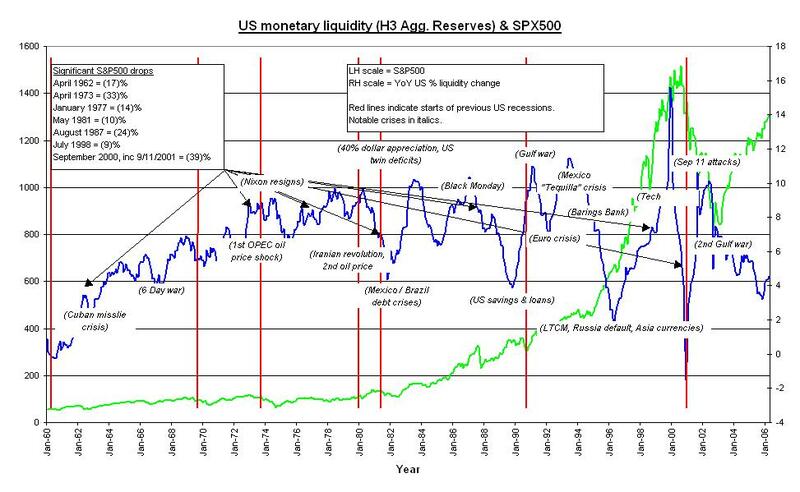 Global Macro: When do liquidity turning points matter? Two years hence, give or take, often has been the answer. 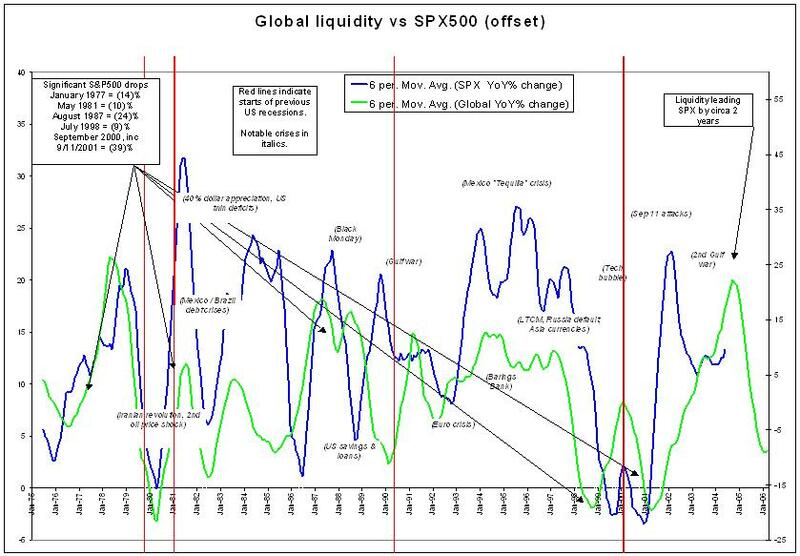 On the face of it, the immediate outlook is poor for the S&P500. But offsetting data, as in this graph, is not science. Depending on which period the best fit is sought for, offsets may range between 18 and 36 months. 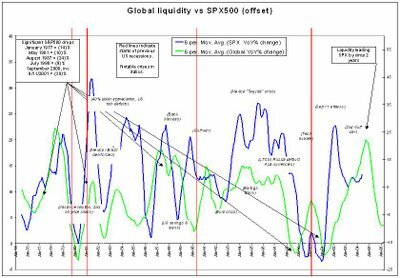 And, if one believes the Big One has already begun, equities are currently anticipating the impact of evaporating liquidity. 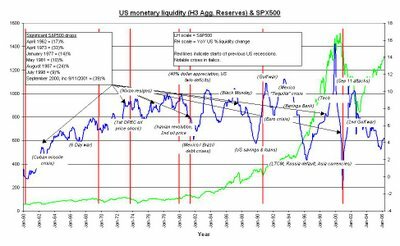 Previous declines in the rate of liquidity expansion – or even when it has contracted – have not automatically led to year over year declines in equity returns, or negative returns. The bottom line is that the two data sets are correlated by about 35%. 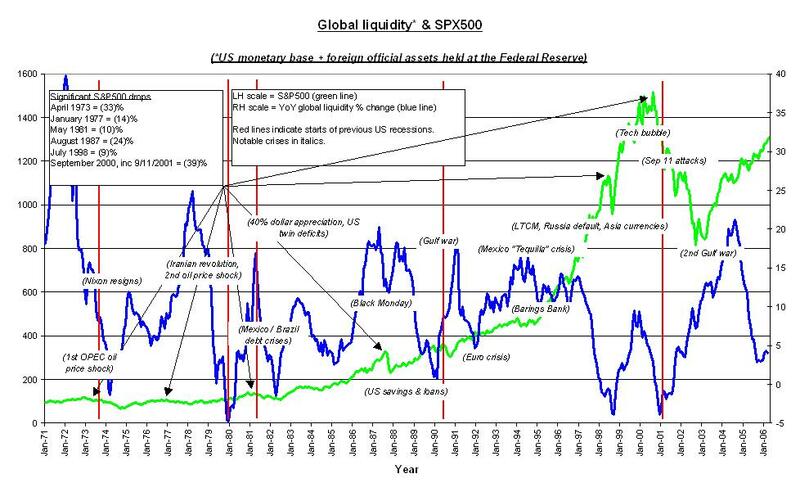 In the context of US economic imbalances, what would seem to matter now is reducing equity risk until it is clear how orderly the unwinding is turning out. Capital Chronicle now uses Feedblitz to alert email subscribers to new postings. The previous system, Bloglet, suffered reliabilty problems and failed to send out several alerts for recent entries. As a result, subscribers will have to visit us to view at least the last 5 articles. Apologies for the break in service. In the Marquez novel, Angela's twin brothers Pedro and Pablo repeatedly announce their intention to kill Santiago for bedding and thus dishonouring their sister before her wedding to Bayardo. And, indeed, they carry out their intention. If hardened number crunchers wonder where this is going, point them towards the last iSoft communiqué. It is another masterpiece of obfuscation by the firm and its public relations advisors Financial Dynamics: instead of any reference to the critical issue of what the auditors have been telling CEO Mr Whiston about his accounting, owners are given one new meaningful item of news - an additional profit warning. This ommission is unsurprising given that iSoft threatened legal action against the last people who wanted to reveal what the Deloitte Touche view of the group's accounting was. Then, in 2004, it was the Guardian newspaper that was compelled to back down from publishing details of the due diligence opinions (as part of the Torex merger). This time, though, it falls to Deloitte Touche to assume, albeit unannounced, the Pablo/Pedro assassin role; and there now remains no legal or other figleaf with which iSoft might conceal its modesty. The auditors have yet to sign off the accounts (if reports are true) casting Mr Whiston firmly in the role of Santiago (whose penultimate outing with the twins was to the local bordello). It is not a particular pleasure to see a man deprived of his employ. But without Mr Whiston's departure the group's ability to win business will continue to labour under the strain of financial rumour for which he is currently and rightly carrying the can. Following the Marquez script, Mr Whiston goes which would make the published accounts, due in June, represent rock bottom. On the other hand, keeping the CEO would mean iSoft resume digging, such is the loss of confidence in the company's accounting and communication. Angela (iSoft) eventually fell for Bayardo (Misys?) but it took 17 years for him to come back for her. With good sense, the iSoft board will do the right thing for owners long before then and set the company on recovery road.